e always start with our own fruit when making our ciders. Then we add apples from other local growers in New Hampshire, Maine, Massachusetts, and Vermont. We also scout out and import ciders, wines, and spirits from around the world. We are a New Hampshire Limited Liability Company (LLC), based in Greenfield, New Hampshire. 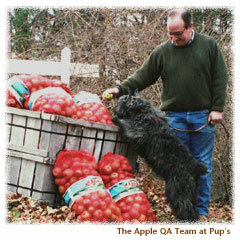 Pup's Cider is licensed by the US Alcohol Tax and Trade Bureau as a Bonded Winery, a Brewery, and as both a Wine, Malt Beverage, and Distilled Spirits Importer and Wholesaler. We are licensed by the New Hampshire State Liquor Commission as a Beverage Manufacturer. Pup's was established in 1999, and is privately held by Rich Stadnik. In addition to Pup's, Rich owns Stadnik & Company, a software and technical services firm founded in 1986. Its hallmark product is ViaFax2, an enterprise strength fax and voice response software solution still used extensively in the chemical and financial services industries.